Sphingomonas macrogolitabida strain TFA has the extraordinary ability of using the organic solvent tetralin (1,2,3,4-tetrahydronaphthalene) as a source of carbon and energy aerobically. Genes required for tetralin biodegradation have been identified and we have elucidate the biodegradation pathway. Transcription of tetralin degradation genes is induced by tetralin, and subjected to the phenomenon of carbon catabolite repression. Understanding the molecular mechanisms by which these signals are perceived, processed and integrated to ultimately control thn transcription activation is the main aim of our work. We have identified the regulator that specifically responds to tetralin, ThnR, a LysR-type of transcriptional activator, (see the work of the collaborator Dr Belen Floriano to find out about its molecular mechanisms). 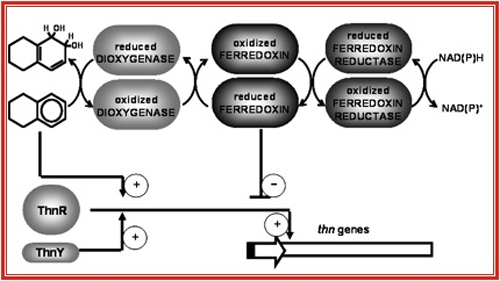 However, there are at least two others players modulating the regulatory system: ThnY a ferredoxine reductase which function remain unknown that it is unequivocally essential for expression of the thn operons. We have also demonstrated that ThnA3, the ferredoxin which transfer electrons to the initial dioxigenase, prevents transcriptional activation by the regulatory system when is presumably in a reduced form. This is an unprecedented mechanism of modulation which avoid efficient induction by a molecule that is not a real substrate of the catabolic pathway. (ii) Establishment of the mechanism by which ferredoxin ThnA3 negatively modulates expression of thn genes.